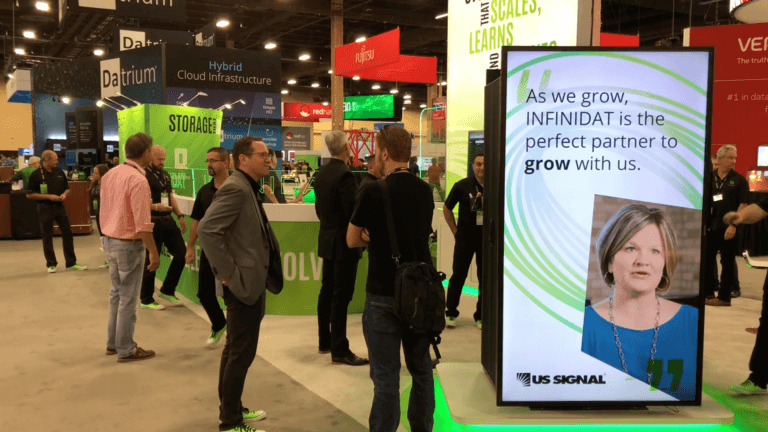 INFINIDAT returned to Las Vegas with “Storage that Scales, Learns and Evolves” with and an entirely new booth design, ready to show off our expanded portfolio announced this past March. The bright colors and the always-on espresso bar created an inviting space that was quickly filled with customers and prospects looking to learn more about our products and services. At the booth, the conversations covered the full spectrum of topics, from how we support thousands of virtual machines with virtually no down time to how we provide the fastest recovery time for petabyte-scale applications on-site and across infinite distance. Just about every conversation touched on the need for performance, availability, and lower cost, a theme we know very well. INFINIDAT also appeared live on “theCube” to talk about how we solve our customers’ problems and support their success. This year we had two sessions – one dedicated to discussing our newest data protection products and features, the other focused on our successful partnership with US Signal. In the first session, Jacob Broido, Chief Product Officer and Neville Yates, Sr. Director of Data Protection Solutions talked with Dave Vellante and David Floyer about how we leveraging the INFINIDAT core technology, used in our enterprise storage solutions, for the data protection and business continuity market. In the second session, Marc Creviere from US Signal and Brian Carmody, INFINIDAT CTO, talked about the success US Signal is having with INFINIDAT and their InfiniBoxes. Brian Carmody reinforced our strong relationships with our customers, explaining how we collaborate with our partners to define and drive our roadmap. 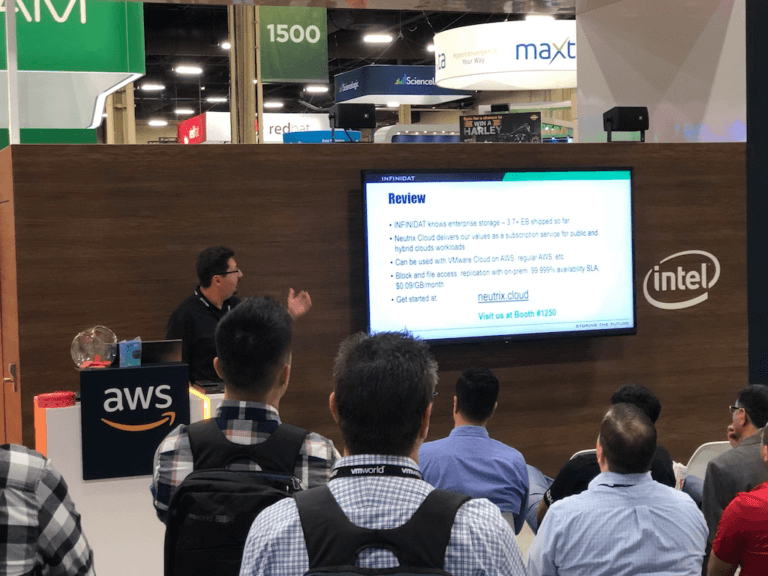 Gregory Touretsky, Sr. Director of Product Managmenet, also gave a presentation at VMworld, thanks to an invitation from our partner at AWS. Gregory presented Neutrix Cloud, our sovereign cloud storage service. He discussed how easy it is to leverage Neutrix Cloud with AWS as well as with the VMware Cloud on AWS. In keeping with the tradition, started last year, our customers generously contributed their praise to another graffiti board. 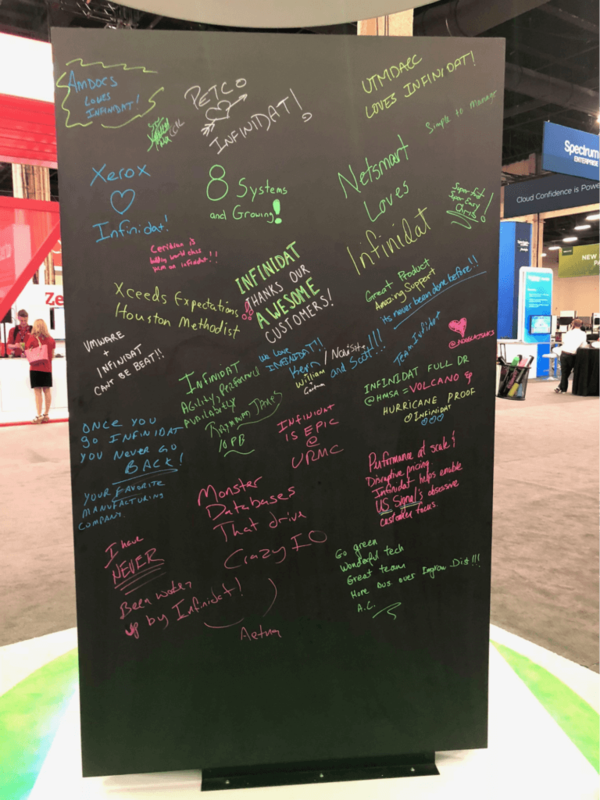 It is easily the best, most satisfying part of VMworld when customers come to the booth and ask if they can add their endorsement to the board. We strive to help our customers succeed, and getting this kind of feedback makes it all worthwhile. If we missed you at VMworld and you still have questions about how we can support the success of your enterprise with any of our storage products or services, please contact us – we welcome the opportunity to talk with you.